1.0.1 What is Women’s Rogaine foam? 1.0.2 Are Women’s Rogaine products right for me? 1.0.3 Will Women’s Rogaine foam work for me? 1.0.4 How is the Women’s Rogaine Foam different than Men’s Rogaine Foam? 1.0.5 What are the most common side effects of Women’s Rogaine foam products? 1.0.6 Can Women’s Rogaine foam products produce unwanted hair? 1.0.7 What is the shelf life of Women’s Rogaine foam products? 1.0.8 Are there any medications that may interact when I’m using Women’s Rogaine foam products? 1.0.9 Can I use Rogaine products if I’m pregnant or nursing? What is Women’s Rogaine foam? Women’s Rogaine products are the first FDA-approved topical treatments clinically proven to regrow hair in women. Women’s Rogaine products come in two forms: 2% Minoxidil Topical Solution and 5% Minoxidil Topical Foam. Are Women’s Rogaine products right for me? Rogaine products are used to treat hereditary hair loss in women over the age of 18 years. The checklist below will help you determine if Rogaine products are right for you. Will Women’s Rogaine foam work for me? The amount of regrowth is different for each person. When using Women’s Rogaine Foam, results may be seen as early as 3 months with once daily use. For some women, it may take at least 6 months for results to be seen. You may need to use Women’s Rogaine foam 2 times a day for at least 4 months before you see results. Not everyone will respond to Women’s Rogaine foam products. The response to Women’s Rogaine products cannot be predicted. No one will be able to grow back all their hair. To see your best results, make sure you apply the product directly to the scalp as directed. How is the Women’s Rogaine Foam different than Men’s Rogaine Foam? 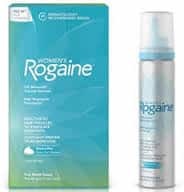 Women’s Rogaine 5% Minoxidil Foam is a once-daily hair re-growth treatment indicated and labeled specifically for women and FDA approval of the product was based on the safety and effectiveness profile demonstrated in clinical studies of once-daily use in women experiencing for Female Pattern Hair Loss. In contrast, Men’s Rogaine Foam is a twice-daily hair re-growth treatment indicated and labeled specifically for men and FDA approval of the product was based on the safety and effectiveness profile demonstrated in clinical testing of twice daily use in men experiencing Male Pattern Hair Loss. As always, we recommend following the labeled dosage when using any Rogaine Minoxidil product. What are the most common side effects of Women’s Rogaine foam products? Some people may experience a dry, itchy scalp and irritation of the treated area. Stop using and ask a doctor if irritation persists. Women’s Rogaine Foam contains alcohol, which can cause burning or irritation of the eyes or sensitive skin areas. If Women’s Rogaine Foam accidentally gets into these areas, rinse with large amounts of cool tap water. Can Women’s Rogaine foam products produce unwanted hair? Unwanted hair growth has been reported on the face and other parts of the body with Rogaine foam use. The unwanted hair growth may be caused by the transfer of Women’s Rogaine foam product to areas other than the scalp, or by absorption into the circulatory system of low levels of active ingredient, or by a medical condition not related to the use of Women’s Rogaine products. If you experience unwanted hair, discontinue using Women’s Rogaine products and see your doctor for recommendations about appropriate treatment. After stopping the use of Women’s Rogaine products, the unwanted hair, if caused by the use of Women’s Rogaine products, should go away over time. What is the shelf life of Women’s Rogaine foam products? The shelf life of the Women’s Rogaine 5% Minoxidil Topical Aerosol is two years, and the shelf life of Women’s Rogaine 2% Minoxidil Topical Solution is five years. Are there any medications that may interact when I’m using Women’s Rogaine foam products? 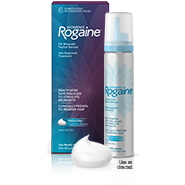 You should not use Rogaine foam products if you are using other topical medicines on the scalp. There are no commonly recognized drug interactions associated with medications taken by mouth and the use of Rogaine products. You should ask your doctor if you are concerned that a medication that you are taking may interact with Rogaine. Can I use Rogaine products if I’m pregnant or nursing? Do not use Rogaine products if you are pregnant or nursing.